It is well known that climate change, land use change, changes in water cycles, and other influencing factors will cause redistribution of species – directly or indirectly. The details of these processes are very complex, however, as effects of global change is manifested very differently on a local scale. In a massive effort, scientists from Spain, India, Nepal, Myanmar, Italy, and Germany worked together in order to assess the combined effects of human pressures and climate change on Asian elephants' distribution, embedded in the human-dominated landscapes in India and Nepal. "We compiled a large database of more than four thousand elephant occurrences and a large geodatabase of environmental predictor variables covering India and Nepal for this study," explains Surendra P. Goyal (Wildlife Institute of India). In a first step, this allowed the scientists to predict the current spatial distribution of Asian elephants as a function of environmental variables. "In addition to ongoing human-induced disturbance, especially in the form of land-use change, elephant distribution is influenced by complex local scale interactions among precipitation and temperature, complicated by seasonal monsoon in this region," explains lead author Rajapandian Kanagaraj from the National Museum of Natural Sciences (MNCN) in Madrid (Spain). The scientists estimated that around 256 thousand square kilometres of habitat are suitable for elephants in India and Nepal. In a second step the effects of climate changes were included into the distribution model to predict future elephant distributions and possible range shifts. Relying on climate and land use data projections for 2050 and 2070, different scenarios were calculated. All scenarios strongly indicate that the interaction between climate change and land use will compound existing threats to the elephant. "We anticipate that elephant range would likely shift towards higher elevations in the Himalayas, and along a gradient of water availability, instead of a simple unidirectional range shift towards higher elevations and latitudes typically expected when temperature is the principal factor," explains Miguel B. Araújo, expert on climate change and biodiversity at MNCN, Madrid, in whose lab this collaborative study was undertaken. In a scenario where only climate change is included, the loss of potential habitat is more moderate, but still substantial with a 17.1 percent loss in one scenario in 2070. "The negative effect is especially severe in the human-dominated landscapes in eastern and southern India," say Priya Davidar and Jean-Philippe Puyravaud (Sigur Nature Trust, India). Gain in potential habitat is indicated in northern and northeastern habitats particularly along the valleys in the Himalayan foothills. "Our model projections suggest that the projected future changes in the distribution of elephants in India and Nepal would be driven mainly by changes in the climatic water balance, followed by changes in temperature and other ongoing human-induced disturbance," Kanagaraj and Araújo conclude. For that reason, building comprehensive and robust spatial models is crucial to assess the impact of environmental changes in wildlife populations. "The database consisted of 115 environmental variables: 60 climatic, 16 human disturbance, 29 forest and vegetation and 10 topographic variables, all at a grid resolution of 1 kilometre," says Thorsten Wiegand, modelling expert from the Environmental Research Centre (UFZ), Leipzig. Occurrence data relied on 4,626 elephant sightings between 1990 and 2017, with the vast majority of sightings after 2002. "The art of modelling here was distilling the most biologically plausible environmental predictors and eliminating redundant correlations," Stephanie Kramer-Schadt, head of the department of Ecological Dynamics at the Leibniz Institute for Zoo and Wildlife Research (Leibniz-IZW), explains the methods. The team calculated and tested several models which can forecast the distribution only from the remaining nine environmental variables. "In the end we have to acknowledge that are dealing with models of distribution and environmental change," Kramer-Schadt adds. This approach enabled the team to develop highly probable scenarios for range shifts of the elephants under global change, but the predictions are always connected with a level of uncertainty. The results of this comprehensive study nevertheless have important implications concerning conservation efforts as the suitability maps and future projections can be effectively used to identify critical habitat areas that require immediate conservation attempts. Furthermore the projections can inspire adjustments to current habitat protection strategies. A supplementary analysis highlighted the importance of connected habitats: "The model only predicts the suitability of a 1 km2 grid cell without accounting for the movement capacity of elephants and their home range sizes, so we added the core range analysis to identify high suitability areas larger than the size of two average home ranges and an analysis of the connectivity of core areas that considers the maximal displacement capacity of elephants," says Kanagaraj. "The results underline the pressure that is expected on the habitats on southern and eastern India as it is where large core areas can be found," says Surendra P. Goyal. Further, the analysis suggests that the fragmented core areas that are located along the foothills forests and floodplains of the Himalaya could be connected by a mixture of poor‐ and high‐quality habitat that should form specific targets for management. These results provide a first assessment of areas that could provide connectivity among core areas. "We are certain that conservation of remaining habitat will always remain the centrepiece of biodiversity conservation," the team states. 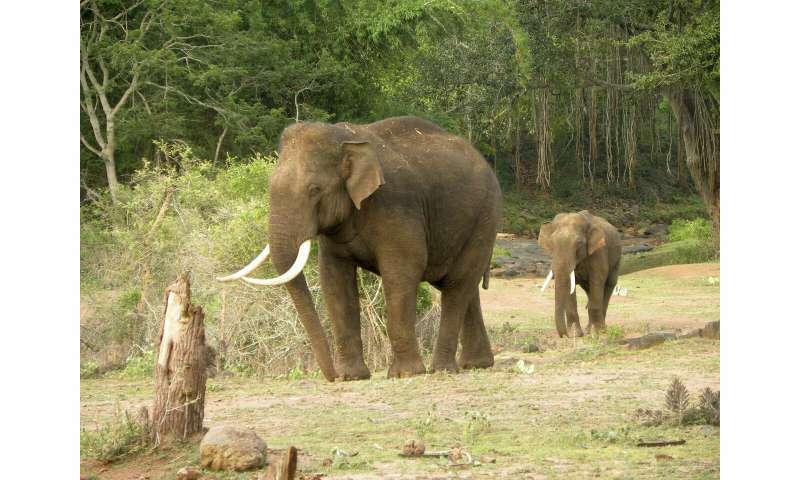 "Our study provides a first assessment on the effect of climate change on the distribution of the Asian elephant in its major habitats in India and Nepal, which could help other assessments over its entire range across South and South‐East Asia, and be useful for developing management plans for wildlife conservation under the aegis of climate change."